A visual sourcebook of 25 modern interiors in a range of mountain settings that is organized into three sections - 'Cabin', 'Chalet', 'Villa' - the houses feature indoor - outdoor living, beautifully crafted materials and a mastery of natural light. 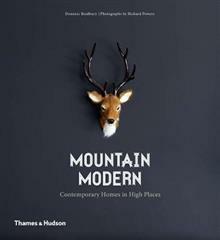 This visual sourcebook of 25 modern interiors in a range of mountain settings features photographs by Richard Powers and text by interiors writer Dominic Bradbury. Organized into three sections - 'Cabin', 'Chalet', 'Villa' - the houses feature indoor - outdoor living, beautifully crafted materials and a mastery of natural light. Photographs of each house reveal its architecture, interior design and surroundings, while plans provide an additional layer of information. Texts tell the story of how the dwelling was sited to make the most of its location, how construction innovations were introduced, and how such solutions provide a comfortable space from which families can enjoy the great outdoors. From the Highlands of Scotland to the breathtaking summits of the Alps and the majestic Rockies, Mountain Modern is a journey to the most stunning homes of our planet.